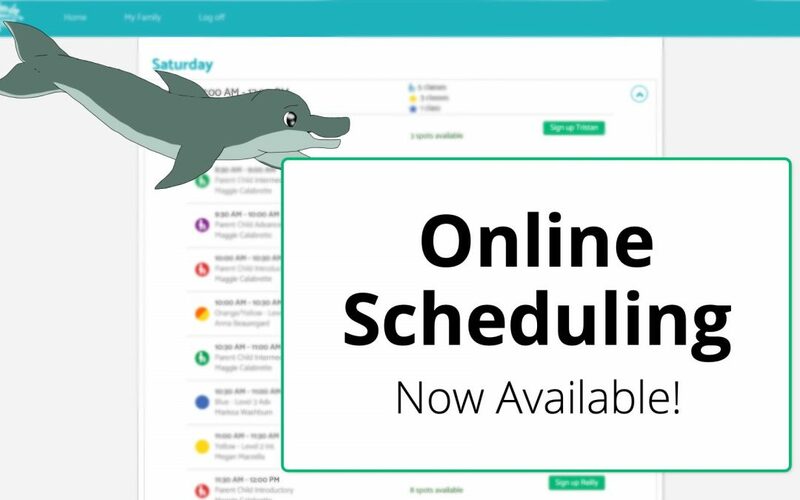 Online scheduling is here! 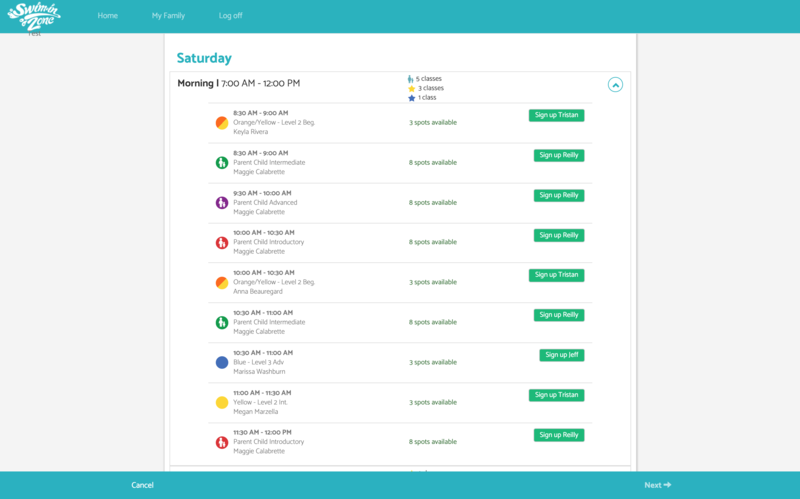 After 2 years of development we are finally ready to release online scheduling. Starting this week, current previous and new clients can register for classes online. Begin scheduling classes from the parent portal homepage. Under the Make Up Classes section you will find the new Schedule Classes Button. Clicking on this button will begin your new schedule classes feature. Where you can search for classes that fit your children’s age and level. You can now see all classes that your children are signed up for in future sessions. Select which session you would like to sign up for. Can I sign up multiple children at once? Yes! 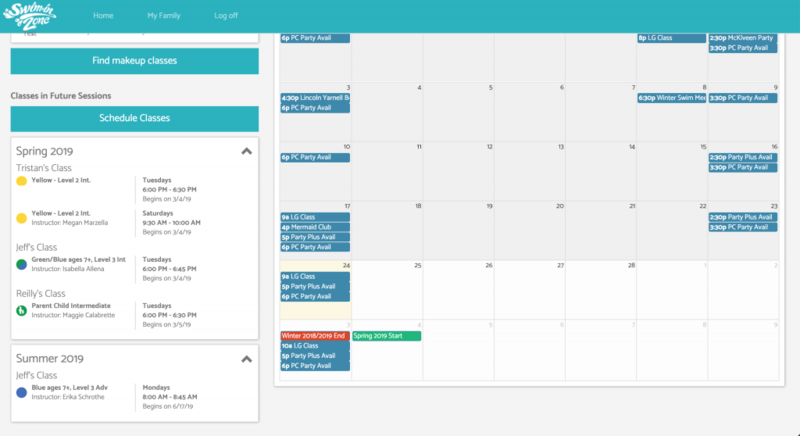 We know many of you have multiple children in your families and we wanted to make it simple for you to schedule all your children at once. Select the child(ren) you would like to sign up for classes. Select your classes for your child(ren). Can I sign up for multiple classes per week? Yes! You will be given an option to sign up for additional classes after you choose your first class. When can we sign up for classes? We will be publishing classes for our spring session this week and summer session sign ups will begin later this spring. I do not have my parent portal login. Don’t worry just give us a call and we can confirm your email address and get you access to the parent portal. If you forgot your password, you can always use the forgot password link to set a new one. If you’re looking for private and semiprivate classes please give us a call. You are probably wondering what will happen to demand scheduling. Demand scheduling is not going anywhere. We will begin registration over the phone just like normal but once a class is created it will then be published to the parent portal for everyone. If you want that perfect day and time for the summer session, you can still get it on the first day of sign ups. Schedule your classes over the phone. Give us a call after you schedule your classes and we will apply a credit to your account. Choose a multiple payment option and give us a call. We will apply a credit to the payments and credit the $5 service as well. Your parent portal is getting better! 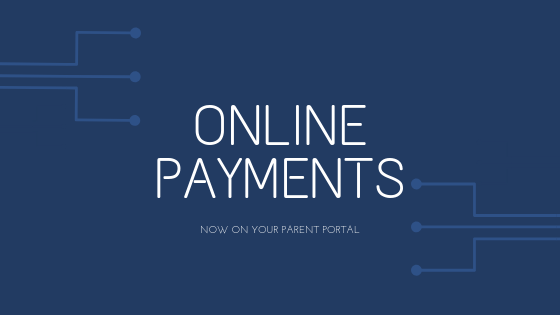 We have added the convenience of online payments to your parent portal. 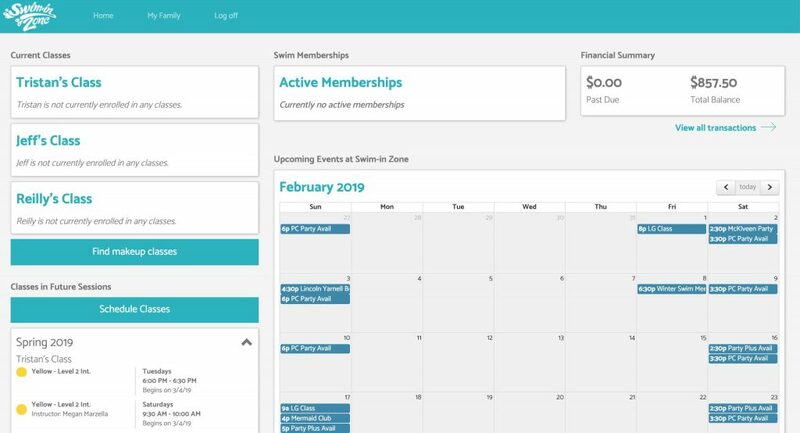 This is a major step for us at Swim-in Zone for the first time in 14 years we have online bill payment for our clients. We have also added new email billing features so keep an eye out on your email. If you do not have your parent portal login, your username is the email address we have on file. You can always give us a call, 610-625-4848, if you are not sure of what email we have on file. Not sure of your password? Use the Forgot Password? on the parent portal to reset your password. Don’t forget you can also schedule your make ups through the parent portal as well! Now you are probably wonder what’s next? Well you have been asking for it for a long time, class scheduling. 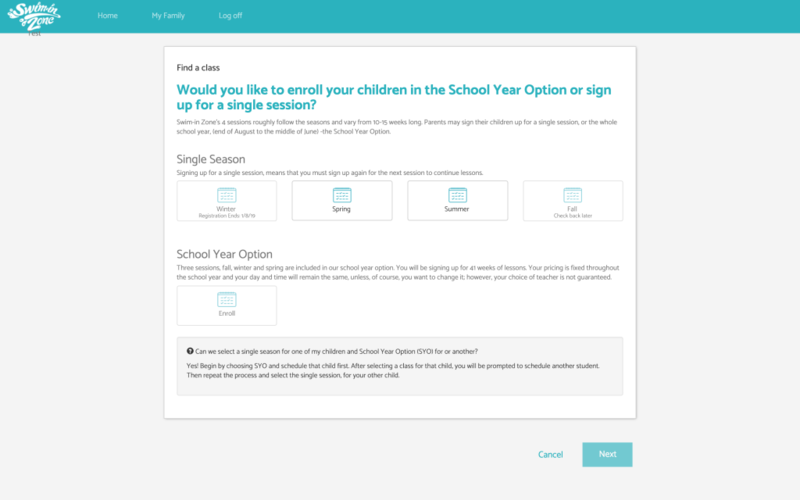 Our next big feature for the parent portal is online sign ups. We have been putting in a lot of thought into this module to make the process as simple and easy as possible for you. We will be developing and testing this feature over the next two months and hopefully rolling it out in the new year (maybe sooner). We will keep you posted on development and roll out of this so stay tuned to our social media, email and app. We are very excited for online scheduling and we hope you are too!